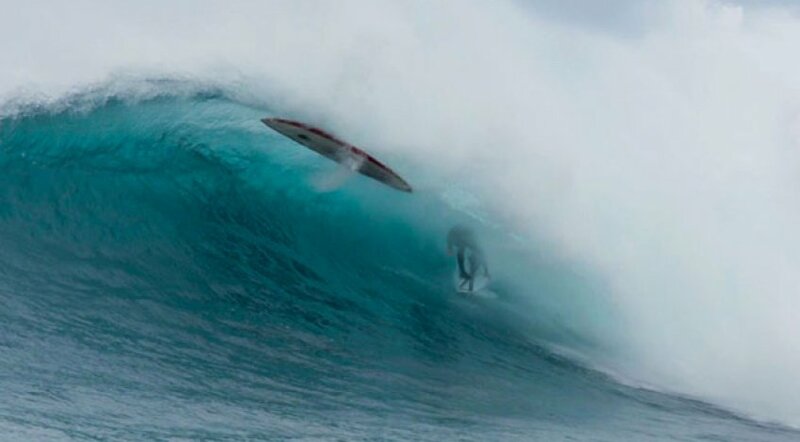 It’s fair to say that Koa Rothman has had a lot of wipeouts. Like, a lot of wipeouts. We’re talking waves the size of buildings crashing down on his back. Hold-downs that would make Jacque Cousteau blue in the cheeks. Violent tropical thrashings that send him bouncing like a rag doll off of some foreign reef. Such is life when you’re as fearless as Koa. But, just recently, Koa experienced the worst wipeout of his entire career. And in came in quite the unusual form. He was surfing a not-to-be-named spot, got barreled and just as he was coming out, he copped a stranger’s surfboard right in the face. Here’s the footage and Koa’s explanation. Ever felt a big wave board? There’s a lot of foam there. And they’re built to be extraordinarily heavy — not exactly the type of object you want beelining at your face. When Koa made it back to the surface, he was convinced that something was severely wrong with his. He asked someone in the lineup to describe his injury, and they said they couldn’t see any damage. Until he smiled, that is. Bad news for his teeth. Good news for his temple. Koa was concussed. And he sprained his neck. And he’s got five new teeth. And he plans on being back in the water in five weeks. As for his mindset? Here’s to a speedy recovery, you trooper.